Maria Lila Meza, a 39-year-old migrant woman from Honduras, part of a caravan of thousands from Central America trying to reach the U.S., sits with her five-year-old twin daughters Cheili Nalleli Mejia Meza and Saira Nalleli Mejia Meza inside their tent in Tijuana, Nov. 26, 2018. A migrant mother photographed running with her daughters from tear gas at the U.S.-Mexico border said she never expected the U.S. Border Patrol to fire gas canisters at children and families. 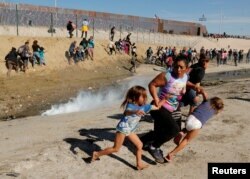 Maria Lila Meza Castro (C), a 39-year-old migrant woman from Honduras, runs away from tear gas with her five-year-old twin daughters Saira Nalleli Mejia Meza (L) and Cheili Nalleli Mejia Meza (R) in front of the border wall between the U.S and Mexico, in Tijuana, Nov. 25, 2018. Migrants sleep on a street near the Chaparral border crossing in Tijuana, Mexico, Nov. 23, 2018.